Did you know that Facebook has an average of 1.5 billion daily active users? This platform presents many excellent opportunities for you to reach interested leads. With Facebook sponsored posts, you can reach and engage people interested in your business. On this post, we’ll discuss Facebook sponsored posts, and three best practices for using Facebook sponsored posts. What are Facebook sponsored posts? Facebook sponsored posts are posts that a company has paid to promote. These posts originally appear on a company’s timeline as organic content. A company pays to promote these posts to boost visibility. Sponsored posts ensure that your followers and new people can see your content. They appear in the timeline just like any other post. It creates a more seamless experience for your audience and doesn’t disrupt their social media activity. Facebook sponsored posts look like organic posts in the timeline. The only indication of them being different from organic posts is the “sponsored” tag. When you post this organic content, individuals can view, like, comment, and share your content with the click of a button. It’s easy to create sponsored Facebook posts too. 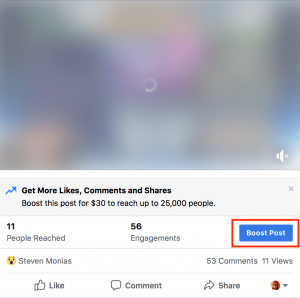 You don’t need to enter the Facebook ads manager to launch a campaign – you can do it straight from the original post. Many times, Facebook will prompt you to promote certain pieces of content to boost engagement. With sponsored posts, you can only promote a page that already exists. Since you must obtain the posts from your own Facebook page, your page must exist first. You can also display your sponsored posts on desktop and mobile feeds. How do I create a sponsored Facebook post? Select the post you want to promote. Click the “Boost Post” button. A pop-up screen will appear. Choose your targeting criteria and decide who you want to see your post. Select how many people you want to reach. Decide how long you want to run your campaign. Click “Boost Now” and launch your campaign. By following these steps, you’ll quickly be on your way to launching your Facebook sponsored posts! How much do Facebook sponsored posts cost? Whenever you start running a campaign, there is always the question of how much it will cost to run a campaign. Your budget is essential to your business, so you don’t want to be left in the dark about pricing. One of the best things about sponsored Facebook posts is that the amount you pay is up to you. You don’t need to have a set amount to start a campaign. It’s important to note, however, that the more money you spend, the better results you’ll drive. This makes it a very budget-friendly option for your business because you can choose the amount that works best for your company. As you learn more about Facebook sponsored posts, you’ll see information about Facebook ads. While these two may seem similar, they are slightly different from one another. Goals Typically focus on a figurative goal (no option to select a goal) such as brand awareness or engagement Offers official goals, such as app downloads, brand exposure, conversions, traffic, lead generation, etc. Overall, you can see how these two different marketing options compare to one another. In general, Facebook sponsored posts are best for reaching people who currently engage with your business and helping them build better brand recognition. Facebook ads are better for obtaining new leads and getting them to take action. Both of these strategies can be extremely beneficial to your business when you combine them in your social media marketing strategy. Facebook sponsored posts are a great way for your business to engage valuable leads. The first step to take when running a Facebook sponsored posts campaign is deciding the purpose of your campaign. You must have a goal in mind if you want to measure the success of your campaign. Most businesses focus on increasing engagement with certain posts or pieces of content. Boosted posts are a great way to get your audience to engage with your content. You can easily measure their engagement too. Your purpose for running your ad influences who you target. If you want to earn conversions, you may focus on reaching people who you know are interested in your page. They’re most likely to convert because they’re familiar with your business. On the other hand, if you’re looking to raise brand awareness, you can target people who like your page already (to build brand recognition further) as well as other audiences. Facebook allows you to target friends of people who are fans of your page. By deciding the purpose of your sponsored Facebook posts, you’ll drive more effective results for your business. It’s essential that you choose the right type of content to promote if you’re going to run successful sponsored Facebook posts. The point of these posts is to blend into a user’s newsfeed seamlessly. You want them to think that it’s just another organic post. If your content is overly salesy or too promotional, you risk deterring people away and wasting money. To ensure you get the most valuable interactions out of your content, choose content that appears to be organic but promotes engagement. Focus on content that provides value for your audience. If you want to see your campaign drive success, boost content that already has traction. If people are already engaging with a specific post on your page, it’s an indication that it’s of interest to your audience. The small scale of engagement may mean that not everyone saw your post. It’s best to promote content that has traction because people are more likely to engage with it. It will be content that is interesting to your audience and more likely to draw your audience’s attention. If you promote a post that has no comments, likes, or shares, your audience is less likely to engage with it in a sponsored post. The content may not be as interesting to them. They also may see that no one is engaging with the post, which causes them to shy away. Overall, choose content that you know will perform well. You’ll see better results with your Facebook sponsored posts campaign. Sponsored posts are an excellent opportunity for your business to build brand recognition and get more people to engage with your posts. It’s a great way to expand your reach and help your business continue to grow. If you want to learn more about Facebook sponsored posts, contact us online to see how we can help you get started with running sponsored posts.